Cummins Westport released its model year 2018 dedicated natural gas engines for regional haul truck/tractor, vocational and transit, school bus, and refuse applications on Tuesday at the Alternative Clean Transportation (ACT) Expo in Long Beach, Calif.
Cummins Westport says the new lineup comes with a change in names. Following Cummins tradition of using B, L, and X series letters, followed by engine displacement. The letter “N” denotes engines that are fueled by natural gas. “Our 2018 product line demonstrates an important milestone in product development for Cummins Westport, creating a move to zero emissions strategy for our customers and industry,” says Rob Neitzke, president of Cummins Westport. “We are particularly pleased that the ISX12N will join the L9N in offering our on-highway customers the benefits of performance and reliability at an ultra-low emissions level described by California’s South Coast Air Quality Management District as equivalent to an electric vehicle. This move to zero emissions strategy means our customers can choose the most affordable path to zero-equivalent emissions with no commercial constraints on supply or technology readiness.” The company says its new B6.7N, L9N, and ISX12N engines continue the evolution of emissions leadership in on-highway natural gas engines from Cummins Westport, featuring Environmental Protection Agency (EPA) and California Air Resources Board (CARB) Optional Low NOx certification, On-Board Diagnostics (OBD), Closed Crankcase Ventilation (CCV) systems, and performance and reliability improvements. The new ISX12N features a redesigned fuel system with fewer parts and improved performance, the company says. 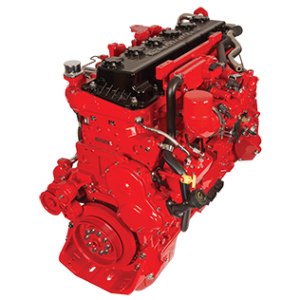 Like the L9N that replaces the ISL G Near Zero, the 2018 ISX12N heavy-duty natural gas engine for regional haul truck/tractor, vocational, and refuse applications will also be certified to EPA and CARB optional low NOx Emissions standards of 0.02 g/bhp-hr. The ISX12N and L9N will be the lowest certified NOx emission engines available in North America, Cummins Westport says. NOx exhaust emissions are 90 percent lower than the current EPA NOx limit of 0.2 g/bhp-hr, and the engines also meet or exceed the 2017 EPA greenhouse gas (GHG) emission requirements. Cummins Westport says its natural gas engines have met the 2010 EPA standard for particulate matter (0.01 g/bhp-hr) since 2001. All CWI engines offer customers the choice of using compressed natural gas (CNG), liquefied natural gas (LNG) or renewable natural gas (“RNG”) as a fuel. Using low carbon intensity RNG fuel provides significant well-to-wheel GHG reductions and is an important aspect of a move to zero emissions strategy. According to California ARB Low Carbon Fuel Standard (LCFS) studies, RNG can reach subzero GHG carbon intensity levels. Additionally, Cummins Westport engines use proprietary spark-ignited, stoichiometric combustion with cooled exhaust gas re-circulation technology, and three-way catalyst after-treatment (TWC). The TWC is packaged as a muffler and is maintenance-free. No diesel particulate filter or selective catalytic reduction after-treatment is required, the company says. The company’s 6.7 to 12 liter engines are designed for truck and bus applications up to 80,000 lb. Available from leading truck and bus OEMs, Cummins Westport says vehicles can be tailored to perform to meet customer requirements with enough range to offer route flexibility without in-route refueling. For example, on highway natural gas trucks can have over 700 mile range capability. The ISX12N will be manufactured in Cummins’ heavy-duty engine plant in Jamestown, N.Y. The L9N and the B6.7N are manufactured in Cummins mid-range engine plant in Rocky Mount, N.C.